…if you and your two mullet-sporting friends go to Walmart just to gather in awe around the shopping cart escalator. I was at Walmart yesterday, and although it’s a well-known fact that Walmart is like the mother-ship for all things redneck, I’ve never witnessed anything like this! My friendly neighborhood Walmart has lower-level parking, so there are escalators for customers’ easy car-to-store access. There are also escalators for the shopping carts (or “buggies,” as they are called in the South) that run parallel to the people-escalators, so you can still take your cart with you and roll right up to your car on the lower parking deck. Another lady had just reached the bottom level with her cart, and it must have been her escalator-riding skills the guys were admiring when I approached them. She glanced up, and we exchanged smiles, but only for a second, so as not to burst out laughing. In anticipation of our firstborn’s arrival, I have grown to appreciate the experience that Hubby and I have had in raising two wonderful pets. Really, they’re like our first “kids” – the sort-of-practice-run for things like keeping another living being alive, establishing routines (sort of), and learning that training and disciplining doesn’t mean creating perfect little soldiers/robots. But seriously, we love our doggies! And I think I should brag on them a little. Our “oldest” is Baily – she’s a gangly dog with funny-looking ears that flop up and to the side, rather than straight down. 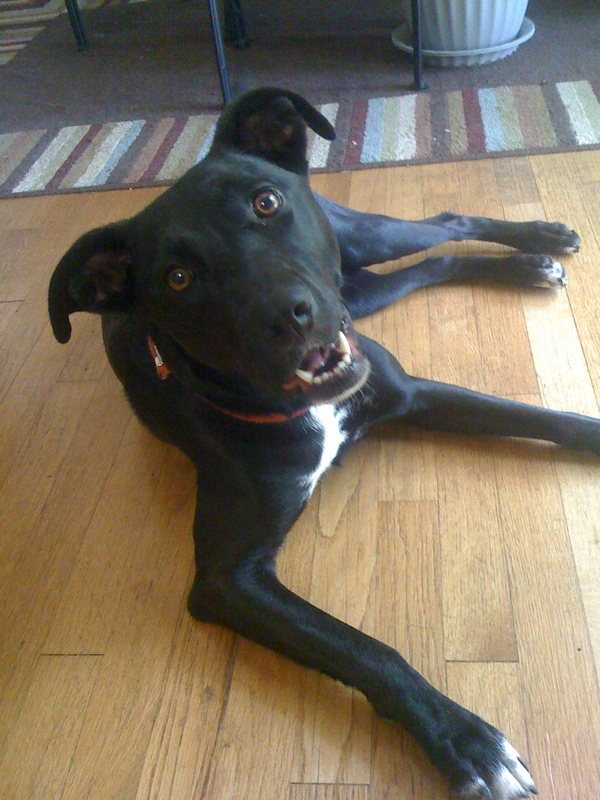 As far as we can tell, she’s a Labrador-Whippet mix…she came from a “whoops” litter and the mama’s owners had no idea where their dog had been before she came home knocked up. Our second dog is Molly. We adopted her from another family a year and half ago, and she is exactly one year younger than Baily. 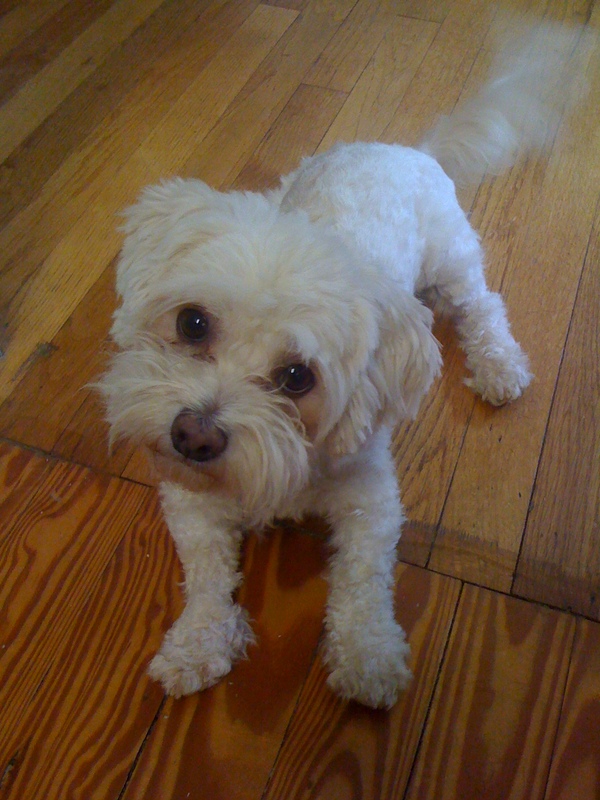 She’s a Maltipoo and weighs about 10 pounds right after a good meal. We never thought of ourselves as small-dog-people. In fact, we were hoping Baily would be as big as a Lab when we adopted her, and were planning to get something like a Retriever or German Shepherd for our second dog. However, it turns out that Baily only seems to find puppies and small dogs agreeable. She’s gotten much better at tolerating other dogs that are her size and bigger, but overall, she’s a small-dog-dog. Enter Molly! It was actually love at first sight for these two. The previous owner brought Molly over to meet Baily, to make sure we were all a good match for each other, and they instantly sniffed nose to nose and took off running circles around the yard together! They pretty much haven’t stopped, either. They’re completely inseparable – they freak out if only one of them gets taken somewhere and the other has to stay. Sometimes they even share Baily’s bed. Anything Baily does, Molly has to do it too!